Play Safe is the premier site for your information about toy safety. Brought to you by The Toy Association, Inc.
are recalled by the u.s. consumer product safety commission. Whether children are playing indoors or outdoors, enjoying their favorite toys or picking out new ones, you want to make sure they stay safe while they play. Check out these tips from the experts at The Toy Association to help your family avoid any playtime mishaps. Being a new parent is exhilarating, joyful … and overwhelming! You’ll likely be inundated with advice from well-meaning friends and family (and maybe a few strangers too)! But when it comes to safe play, you can trust the safety experts at The Toy Association. We’ve compiled a few tips for the first-time parent. Keep stuffed toys and other objects (like quilts, pillows, etc.) out of the cribs of sleeping infants and younger children. If children roll their faces against these objects while napping, it can obstruct their breathing. Small parts—whether they are from toys, other items found around the home, or pieces of food such as hot dogs, grapes, etc.—can pose a risk to children under three and those who mouth items. Keep those items away from small children and take care at snack time when these foods are served. For children under 18 months of age, avoid toys with strings, straps, or cords longer than twelve (12) inches. Inspect toys at the store, looking for sturdy parts that can stand up to the rigors of your child’s play, and always check the age label on a toy to be sure it is right for your child. Second-hand and hand-me-down products should be carefully inspected for wear-and-tear, breakage, sharp edges, etc. Check the latest recall information to be sure you’re not inadvertently using a recalled product. Consider placing vintage or collectible toys out of the reach of children as they may not comply with the latest safety standards. Remove and discard all packaging from a toy before giving it to a baby or small child. Read instructions for assembly and use. For children too young to read, demonstrate for them how to safely play with the toy. Complete and return warranty cards (which are used if a recall is issued). Keep product literature on hand in case of future questions. For even more safety tips on everything from baby strollers to building a safe nursery, visit our friends at: Baby Safety Zone! No matter how old they are or where they’re playing, we know your little one’s safety is your top concern. Here are a few things to keep in mind to make sure playtime for kids of all ages is both fun and safe. Parents or adults should always supervise play, especially for younger children. Be sure to check and follow age guidance and other safety information on toy packaging. Remember, the age-grading isn't about how smart your child is—it’s safety guidance that’s based on the developmental skills and abilities of children at a given age, and the specific features of a toy. Avoid toys with small parts when shopping for children under age three (3) and children who mouth toys. Test the size of toys and other objects around the home with a Small Parts Tester. Check to see that plush (stuffed) toys have age-appropriate features such as embroidered or well-secured eyes and noses for younger children, and seams that are reinforced to withstand an older child’s play. Toys are subject to safety standards that limit the sound level and potential impact on children's hearing — but other electronics found around the home are not. Be mindful of the noise in a child's environment and limit kids’ exposure to excessive noise. When it comes to toys, pick ones that have a volume control. Shop at a retailer you know and trust. Exercise caution when buying toys at flea markets, garage sales, second-hand / thrift stores, etc., as these vendors may not be monitoring for recalled products. Dispose of all unnecessary toy packaging and gift-wrap as soon as possible (piles of discarded gift-wrap can conceal sharp objects and the edges of hard plastic packaging that can cut small fingers). Read instructions carefully. Save directions, warranties, and assembly hardware. Get on the floor and play with your kids! Demonstrating the correct way to use a toy or game is the best way to make sure your child understands how to properly and safely enjoy it. At parties and other festive events, be sure to supervise children around latex balloons. Un-inflated balloons and broken pieces can pose a choking hazard. Store toys safely in an easily accessible storage bin. Lidded toy storage should be non-locking and have special safety features like air holes, spring-loaded hinges and clearances at the hinges to make sure little fingers won’t get caught. Organize and store toys to prevent slips, trips, and falls. Keep a separate toy chest for older kids whose toys may contain small parts. Enlist their help in keeping their toys out of the hands of younger siblings. Regularly sort through the toy box to discard broken toys. Don’t forget to speak to grandparents and other caregivers about the importance of choosing appropriate toys and supervising play! Make adult supervision a crucial part of outdoor play. Kids should never be left alone near inflatable "kiddie" pools, swimming pools, beaches, lakes and other bodies of water. Toys should be kept out of kids’ reach and away from water when they’re not being used so little ones aren’t tempted to play in or near the water alone. Always keep toys away from unsupervised areas like driveways and streets with traffic so they don’t lure a child into a dangerous situation. Make sure your kids wear helmets, knee pads, and other protective gear when playing with all ride-on toys, including bicycles, tricycles, scooters, skateboards, and skates. For more bike safety tips, including how to check if a helmet fits properly, visit the U.S. Consumer Product Safety website. Outdoor play areas should offer some shaded cover (when it’s practical) to protect kids’ sensitive skin from the sun’s intense rays. Children should wear appropriate sun protection (sunscreen, clothing, hats, sunglasses) to avoid overexposure while they play. Make sure your kids drink plenty of fluids during and after play to keep them hydrated. Organize and store toys to prevent slips, trips and falls. If you have access to a garage or outdoor shed, you can designate “parking” spaces for bikes and other ride-on toys, and store smaller items like skateboards and skates on shelves. Small toy parts and other small objects found around the home (like buttons, coins, paperclips, hair accessories, etc.) can be a hazard to children under 3 and kids who still tend to put objects in their mouths. An easy way to check whether an object is too small to safely give your child is to use a Small Parts Tester! The Small Parts Tester is an effective, easy-to-use tool. Its cylinder mimics the size and shape of a child’s throat—2.25 inches long by 1.25 inches wide. To test whether an object might be a choking hazard, place the object without compressing it inside the cylinder. If it fits entirely, it fails the safety test. The Small Parts Tester is the federally approved tool for testing to see whether toys meet the size requirements outlined in the small parts regulation, which was developed using research and recommendations from pediatricians, child development experts, government officials, and industry experts and has been adopted around the world. Small Parts Testers are sold on Amazon and at many toy and children’s stores. Magnets can be a fun and educational feature in a toy. However, certain small, powerful magnets (known as "rare earth magnets") can pose a serious risk to children if they’re swallowed. There are strict federal standards in place to make sure that these magnets aren’t used in small toy parts that could be accessible to young kids. Some non-toy products, like office supplies, desk puzzles, etc., may contain rare earth magnets. These items should never be given to kids under 14 or left within their reach. Instruct kids of all ages to never put these magnets in or near their mouths or noses. Swallowing or inhaling multiple magnets can lead to serious internal injuries, infection and even death, so keep a watchful eye on your kids! If your child does swallow a magnet, seek medical treatment immediately. Small batteries, often used in household products, hold a "hidden" hazard for young kids who tend to mouth objects. When it comes to battery safety, toys have led the way: there is a longstanding federal law that requires batteries in toys for young children to be kept inaccessible, thanks to the use of a locking mechanism. But lots of other types of products found around the house use small batteries — so there are still things you can do to keep your kids safe from battery ingestion. Never leave batteries out and within kids’ reach. When you replace a battery in a toy or other item, carefully re-engage the locking mechanism of the battery compartment so kids can’t access it. Throw away used batteries right away. If your child swallows a new or used battery, seek medical attention immediately. This section addresses new and emerging toys. Check back here often for up-to-date safety advice on latest must-have playthings. Avoid toys with small parts for kids under 3.
with small parts have a warning label on the packaging, so keep a careful eye out as you shop! Based on child development research, this guide will help you pick out appropriate playthings for your kids at every age and stage of childhood! Some toys are recommended for more than one age category, since kids of different ages often enjoy the same toy, each playing with it at his or her own level. Babies rely on sight, sound, touch, taste, and smell to learn about their new world. To delight their senses and encourage their exploration, look for toys that make noise or feature high-contrast, black-and-white, or brightly colored images. Textured toys that are safe for mouthing are great for infants who can reach for objects. Large, interlocking rings or keys. * These items should never be left in the crib of a sleeping child. ** Remove these items when your baby is five months old or is able to push up on their hands and knees. At this stage, infants begin to master motor skills that introduce them to new and exciting ways to play. When babies can sit up, they enjoy toys they can bang, drop, stack, put in and take out, and open and shut. When they graduate to crawling, cruising, or walking, they get a huge kick out of toys that can move along with them. By now, toddlers are full-fledged explorers. They need toys that inspire physical play – walking, climbing, pushing, and riding – and ones that encourage experimentation and manipulation. At this age, kids love props and role-play toys that let them imitate adults, as well as toys that allow for solitary play. Older toddlers love testing their physical skills, so find playthings that get them jumping, climbing, and throwing. This age group also has good hand-eye coordination and enjoys putting their fine motor skills to work with basic arts & crafts, puppets, blocks, and simple puzzles. Toys that encourage open-ended, imaginative play are also great for this age. Children in this age group begin to actively play with each other. Preschoolers and kindergartners are masters of make-believe, so toys that inspire imaginative play are great at this stage. Arts & crafts are also popular, because they encourage hands-on exploration and creativity. The Toy Association was on ABC7 Chicago to share some important tips for safe outdoor play. Toys are remarkably safe – all toys sold in the U.S. have to comply with tough federal safety standards. Toy recalls are a rare but important part of the process of making sure your child's playthings are safe. Recalls are a sign that the safety system works – they're the "safety net" used to remove any faulty products from stores and people's homes. We’ve gathered CPSC recall data for the past four years to help you check whether you need to take action on any recalled toys that may be in your home. For more information on recalls, visit www.recalls.gov. Hazard: The steam dome on the toy train’s engine car can come loose, posing a choking hazard. Description: This recall involves all five pieces of the wooden toy train carts. The train carts have a blue base, and colorful wagon on top, as either the front part of the train, with two steam domes, an apple cart, a wood log cart, a milk cart and a caboose cart. All train carts were sold with a white label, which was placed around each cart with a nylon string. The model number (3010874) and batch number (211693US) is printed on the label. Each piece has been sold individually. Sold at: Flying Tiger Copenhagen stores nationwide from November 2018 through March 2019 for about $2. Remedy: Consumers should take the recalled toy train cart away from children immediately and return it to the nearest Flying Tiger Copenhagen store for a full refund. No receipt is needed. Consumer Contact: Flying Tiger Copenhagen toll-free at 844.350.0560 from 8 a.m. to 5 p.m. ET Monday through Friday, email at info.us@flyingtiger.com, or online at www.flyingtiger.com and click on “Product Information” at the bottom of the page for more information. Hazard: The wheels on the vehicles can detach, posing a choking hazard to children. Incidents/Injuries: There have been four reports of the wheels detaching including a report of a missing wheel when opened. No injuries have been reported. Description: This recall includes the Bullseye’s Playground toy vehicles. The vehicles were sold individually in stores and as an 8-pack assortment online. The vehicles include a caboose, Santa in sleigh, ice cream truck/food truck, train, police car, fire truck, taxi, and digger. The item number, DPCI (model number), and UPC can all be found on a white sticker placed on the bottom of each vehicle. View the list of item numbers included in the recall. Sold exclusively at: Target stores nationwide and online at Target.com from October 2018 through November 2018 for about $1 for individual vehicles and for about $8 for the 8-pack. Remedy: Consumers should immediately take the recalled toys away from children and return the toys to any Target Store for a full refund. Consumer Contact: Target at 800-440-0680 from 7 a.m. to 8 p.m. CT daily or online at www.target.com and click on “Recalls” at the bottom of the page, then on “Toys” for more information or the “Product Recalls” tab on Target’s Facebook page for more information. Hazard: A metal grommet used to attach a fabric flap to a page in the book can detach, posing a choking hazard to young children. Remedy: Consumers should immediately take the recalled books away from children, stop using them and return it to the place of purchase or contact Manhattan Toy for a full refund. Description: This recall involves “Find the Bear” soft fabric books with a variety of fabric flaps sewn or attached to the pages. The front cover has blue and purple horizontal stripes and a panda bear’s face sewn on. The Manhattan Toy logo is printed on a sewn-in label on the side of the book. Lot code “208150 AJ” is printed on another sewn-in label. Sold At: Independent specialty retailers nationwide and online at Amazon.com, Buybuybaby.com, Manhattantoy.com and other websites from March 2017 through July 2018 for about $18. Consumer Contact: Manhattan Toy at 800-541-1345 Monday through Thursday from 8 a.m. to 5 p.m. CT and Friday from 8 a.m. to 12 p.m. CT or online at www.manhattantoy.com and click on “Recalls” for more information. Hazard: The small feet on the giraffe-shaped nightlight can detach, posing a choking hazard to small children. Remedy: Consumers should immediately stop using the recalled nightlights and contact HoMedics for a full refund. HoMedics is contacting all known purchasers directly. Description: This recall involves the HoMedics MyBaby Comfort Creatures Giraffe Portable & Bedside Nightlight, model MYB-N100GIR. The affected nightlights have the date code GP230118 or GP290318 and the date code is located on the underside of the product. It can be powered by an AC adaptor or two AA batteries. It is yellow with brown spots and white underbelly. The nightlight is about 3 inches long, 5 inches wide, 7 inches high, and weighs less than 1 pound. Sold At: Hinda Incentives, Power Sales, and online at Amazon.com and HoMedics.com from March 2018 through October 2018 for about $20. Consumer Contact: HoMedics at 800‑466‑3342 from 8:30 a.m. to 7 p.m. ET, Monday through Friday or online at www.homedics.com and click on the Product Recall tab for more information. Remedy: Consumers should immediately stop using the recalled bracelets, take them away from young children and contact Fantasia Accessories to receive a free replacement product. Description: This recall involves children’s furry critter plush slap bracelets in panda, unicorn and heart designs. The recalled bracelets are made of a metal band covered with a protective fabric. Only slap on bracelets are included in this recall. Sold Exclusively At: Target stores nationwide and online at Target.com in July 2018 for about $5. Consumer Contact: Fantasia Accessories at 800-624-4826 from 9 a.m. to 5 p.m. ET Monday through Friday, email at info@fantasia.com or online at www.fantasia.com and click on “Safety Information” for more information. Hazard: Paint on the maracas, xylophone and carrying case contains levels of lead that exceed the federal lead paint ban. Lead is toxic if ingested by young children and can cause adverse health issues. Remedy: Consumers should immediately stop using the recalled instrument sets and carrying case, take them away from children and contact Creative Sto for a full refund, including the cost of shipping the product back to Creative Sto. The firm is contacting all known purchasers directly. Description: This recall involves INNOCHEER children’s musical instruments sets. The 18-piece instrument sets have one xylophone, two mallets, two maracas, one jingle stick, one sleigh bell, four shaker eggs, two finger castanets, one rainbow bell stick, one mini tambourine and one triangle with striker. The instruments set comes inside a clear plastic bag that measures about 8.9 inches by 8.9 inches by 3.2 inches and has a green trim and a yellow zipper and handles. INNOCHEER is printed in green on the front of the bag. Sold Exclusively At: Amazon.com from June 2018 through August 2018 for between $21 and $33. Consumer Contact: Creative Sto toll-free at 866-322-3361 from 8 a.m. to 6 p.m. ET Monday through Friday or email at support@myinnocheer.com for more information. Hazard: Pieces of the rattle can detach, posing a choking hazard to infants. Remedy: Consumers should immediately take the recalled rattles away from children, stop using them and contact i play for instructions on how to receive a $50.00 coupon code to redeem towards the purchase of new products and shipping costs. Description: This recall involves the Green Sprouts brand flower rattle made from wood. The recalled multi-colored rattles are made from natural wood and measure 2.5 inches long by 2.5 inches wide by 4 inches high. Attached to the circular handle are three round wooden balls shaped like flowers, including one that contains a silver metal bell, all attached with an elastic cord. “Green Sprouts,” “Made in Taiwan” and a date code number (14714 or 21815) are printed on the circular rattle handle. Sold At: Whole Foods Market stores and other stores nationwide and online at Amazon.com and other websites from December 2014 through October 2018 for about $15. Consumer Contact: i play at 800-876-1574 from 9 a.m. to 5 p.m. ET Monday through Friday, email at contactus@iplaybaby.com or online at www.iplaybaby.com and click on “Health & Safety” for more information. Hazard: The tire on the skateboard can deflate, posing a fall hazard to the user. Remedy: Consumers should stop using the skateboards immediately and contact Yvolve Sports to receive a new permanent warning label and updated instructions on how to properly inflate the tire. New instructions can also be obtained through the firm’s website at https://www.neonlyghts.com/pub/media/manuals/Neon_Nitro_8_IM.pdf. Description: This recall involves the Neon Nitro 8, a self-balancing, single-wheeled, battery-powered, electric skateboard from Yvolve Sports under the Neon brand. The product is powered by the user placing one foot on the rear and front decks, gaining balance and then shifting their weight backwards or forwards to control the speed. “Neon” is printed on the skateboard. Sold At: Walmart, Toys “R” Us and online at Amazon.com from October 2017 through September 2018 for about $500. Consumer Contact: Yvolve Sports toll-free at 855-981-7177 from 9 a.m. to 5:30 p.m. PT Monday through Friday or online at www.YvolveSports.com and click on “Contact Us” for more information. Hazard: The joints on the vinyl dolls can break, creating broken pieces that pose a choking hazard to young children. Remedy: Consumers should immediately take the recalled dolls away from children and contact Boy Story LLC for instructions on how to receive a full refund of the purchase price. Description: This recall involves four styles of Boy Story action dolls. They include the Mason and Billy Action Dolls, and the Mason and Billy HeForShe Special Edition Action Dolls. The recalled dolls are vinyl and measure 4 inches long by 7 inches wide by 18 inches high. They also came with outfits consisting of a button-up shirt, white t-shirt and jeans. Boy Story LLC is stamped on the left foot of each doll. Sold At: Online at www.biddleandbop.com and small retailers from December 2016 through May 2018 for about $100. Consumer Contact: Boy Story collect at 240-670-0221 9 a.m. to 5 p.m. ET Monday through Friday, email at questions@boystory.com or online at http://www.boystory.com/productrecallform.pdf for more information. Hazard: The orange and yellow surface paint on the rubber critter toys contains levels of lead that exceed the federal lead paint ban. Lead is toxic if ingested by young children and can cause adverse health issues. Remedy: Consumers should immediately take the recalled rubber critter toys away from children and contact BSN SPORTS for a merchandise credit. BSN SPORTS is contacting all known purchasers directly. Description: This recall involves all rubber critter toys sold in various colors and animal shapes including octopus, alligators, chickens, frogs, pigs, penguins and cows. The toys are primarily used to play physical education tossing games. They were sold individually and in sets ranging from two to 24 rubber critters. Sold At: BSN SPORTS and US Games catalogs, and online at www.amazon.com, www.athleticconnection.com, www.bsnsports.com, www.esportsonline.com and www.usgames.com from February 2017 through June 2018 for about $10 for an individual rubber critter and up to $145 for a set. Consumer Contact: BSN SPORTS toll free at 888-847-8816 Monday through Friday from 7 a.m. to 6 p.p. CT or online at www.bsnsports.com, www.usgames.com, www.athleticconnection.com and www.esportsonline.com and click on the product recall link at the bottom of the page or www.recallrtr.com/rubbercritters for more information. Hazard: The rubber tires can separate from the wheels, posing a choking hazard for young children. Remedy: Consumers should immediately take the recalled toy away from children and return it to the store where purchased or contact Manhattan Toy for a full refund. Description: The Pull-Back Speedy Jet is a wooden toy airplane with a blue painted body, natural wood wings and plastic wheels with black rubber tires. The toy has a pull-back feature that propels the plane forward. The model number and lot code are printed on the bottom of the plane. The recall only includes toy planes with lot code 155400 EJ. Sold At: Small independent stores from August 2017 through June 2018 for about $8. Consumer Contact: Manhattan Toy Company at 800-541-1345 from 8 a.m. to 5 p.m. CT Monday through Thursday and 8 a.m. to 12 p.m. CT on Friday, or online at www.manhattantoy.com and click on "Recalls Information" at the bottom of the homepage for more information. Hazard: The wheels and axles can detach from the wooden toy car, posing a choking hazard to young children. Remedy: Consumers should immediately stop using the recalled toy cars, take them away from young children and contact a local authorized Porsche dealer to return the recalled toy car and receive a full refund. Description: This recall involves a blue wooden toy Porsche car with tan wheels. The Porsche crest is printed on the front of the recalled toy cars. “PORSCHE” is printed on both sides of the recalled toy cars. They measure about 4 inches long by 2 inches wide by 1 1/2 inches tall. The underside of the toy has “BAJO” and a lot number printed on it. Consumer Contact: Porsche at 800-767-7243 from 9 a.m. to 5 p.m. ET Monday through Friday or online at https://press.porsche.com and click on "Recall" in the middle of the page. Hazard: The red crayons in the multi-color sets can contain glass, posing a laceration hazard to the user. Remedy: Consumers should immediately stop using the recalled crayons and contact Discount School Supply to obtain a free full replacement set. Discount School Supply is contacting all known purchasers directly. Incidents/Injuries:The firm has received two reports of a red crayon with glass in it. No injuries have been reported. Description: This recall involves Colorations™ brand 200 extra-large crayon sets, including 25 red crayons. The extra-large crayons measure about 4.5 inches long and .5 inches in diameter. The crayons were packaged in a purple and yellow box with the Colorations® logo printed on the box. Sold At: Exclusively online at DiscountSchoolSupply.com from June 2017 through October 2017 for about $36. Consumer Contact: Discount School Supply at 800-338-4430 from 8 a.m. to 8 p.m. ET Monday through Friday, email at recall@discountschoolsupply.com, or online at www.discountschoolsupply.com and click on “Safety Information” for more information. Hazard: The battery compartment in the spin art kit can overheat, posing fire and burn hazards. Remedy:Consumers should immediately take the recalled spin art kits away from children, stop using them and return them to any Michaels store for a full refund. Description: This recall involves spin art kits sold under the Michaels private brand Creatology®. The 34-piece kit includes one battery operated spin art wheel with cover, paint, paint brushes, and paper. The recalled art kits are blue and have SKU number 197861. Sold At: Exclusively at Michaels stores nationwide and online at www.michaels.com from August 2011 through February 2018 for about $25. Hazard: The battery compartment in the pottery wheel kit can overheat, posing fire and burn hazards. Remedy: Consumers should immediately take the recalled pottery wheel kits away from children, stop using them and return them to any Michaels store for a full refund. Incidents/Injuries:The firm has received one report of overheating, and one report of a fire in the battery compartment in the pottery wheel kits. No injuries have been reported. Description: This recall involves pottery wheel kits sold under the Michaels private brand Creatology®. The 16-piece kit includes a battery operated pottery wheel, 2 bags of clay, 4 molding tools, 6 paints, 2 paint brushes, and a sponge. The recalled pottery wheel kits are blue and have SKU number 078859 and one of the following UPC codes printed on the barcode on the back of the box. Consumer Contact: Michaels at 800-642-4235 from 9 a.m. to 7 p.m. CT Monday through Friday or online at www.michaels.com and click on “Product Recalls” at the bottom of the page for more information. Hazard: The bath toy can break apart exposing small parts, posing a choking hazard to young children. Remedy: Consumers should immediately take the bath toy away from young children and contact Munchkin for a free replacement bath toy of comparable value. Incidents/Injuries:The firm has received one report of the toy breaking apart and exposing small beads. No injuries have been reported. Description: This recall involves Munchkin’s Waterpede bath toys. The one piece multi-colored Centipede -shaped toy allows water to be scooped from the top, and flows through the chambers of bottom. The bath toy is 100% plastic and is for children six months and up. Sold At: Babies R Us, Target, and other stores nationwide and online at munchkin.com from September 2015 through January 2018 for between $5 and $7. Importer(s): Munchkin Inc., of Van Nuys, Calif.
Consumer Contact: Munchkin toll-free at 877-242-3134 from 8 a.m. to 5 p.m. PT Monday through Friday or online at www.munchkin.com, click on Help at the bottom of the page and then Recalls for more information. Hazard: The steering wheel on the go-kart can detach, break or crack while in use, posing a laceration and/or collision hazard to young children. Remedy: Consumer should immediately stop using the recalled go-karts and contact Hauck for a new steering wheel. Incidents/Injuries:Hauck has received 639 reports in the United States of the steering wheel detaching, breaking or cracking with one resulting in a laceration to a child’s face requiring stitches and one resulting in a minor scrape to a child's chest. Description: This recall involves the Nerf® Battle Racers, a four-wheel pedal powered go-kart for children ages 4 to 10. The “Nerf” logo can be found on each side of the go-kart and is etched into the black seat. The wheels are black and orange. It measures approximately 50 inches long by 27 inches high by 24 inches wide. The model number T91869, and the date of manufacture is printed on a white sticker located on the underside of the seat. Only go-karts with a date of manufacture between 01/2016 and 03/2017 are being recalled. Sold At: Orsheln Farm, Shopko, Target, Toys R Us, Wal-Mart stores nationwide and online at Amazon.com and Fingerhut.com between January 2016 and March 2017 for between $200 and $300. Consumer Contact: Hauck toll-free at 877-428-2545 from 9 a.m. to 5 p.m. ET Monday through Friday or online at www.hauck-toys.com and click on "Product Recall" at the bottom of the page for more information. Hazard: The ball on the end of the toy xylophone beater stick can separate, posing a choking hazard to young children. Remedy: Consumers should immediately take the recalled toy xylophone beater sticks away from children, stop using them and contact Wild & Wolf for a free replacement beater stick. Incidents/Injuries:The firm has received one report of the ball separating from the beater rod and one report of the ball being loose. No injuries have been reported. Sold At: Barnes & Noble, Patina, Urban Outfitters stores and other stores nationwide and online at PetitCollage.com and other websites from August 2017 through February 2018 for about $24. Importer(s): Petit Collage, of San Francisco, Calif. Distributor(s): Wild & Wolf, of U.K.
Consumer Contact: Wild & Wolf toll free at 855-215-5879 from 8 a.m. to 5 p.m. ET Monday through Friday or online at www.petitcollage.com and click on “Product Safety” or www.wildandwolf.com and click on “Product Safety News” for more information. Hazard: The batteries in the flashlight can overheat, causing the flashlight to become hot, posing burn and fire hazards. Remedy: Consumers should immediately take the flashlight that was sold with the hat away from children, stop using it, remove the batteries and dispose of the flashlight and contact Spirit Halloween for a full refund. Customers will be asked to provide a photo of the tag located under the ear in the hat. Incidents/Injuries:The firm has received three reports of the flashlight overheating and one report of an overheating flashlight in Canada. No injuries or fires have been reported. Description: This recall involves the Nickelodeon PAW PATROL Deluxe Marshall Hat sold with an accessory flashlight. The PAW PATROL Marshall hats are red with a yellow ribbon, black and white spotted dog ears and a black flash light attached to the side of the hat. The flashlight is included with the hat and they share the SKU number. Only flashlights with SKU 01292093 and date codes 1703RY01, 1603RY01, and 1503RY01 are involved in this recall. The SKU number and date codes are on the sewn in label under the ear on the hat. Sold At: Spirit Halloween stores nationwide from September 2015 through November 2017 for about $13. Importer(s): Spencer Gifts, LLC of Egg Harbor Twp, N.J. Distributor(s): Spirit Halloween, of Egg Harbor Twp, N.J.
Consumer Contact: Spirit Halloween toll-free at 866-586-0155 from 9 a.m. to 5:30 p.m. ET Monday through Friday, email at GuestServices@spirithalloween.com or online at www.spirithalloween.com and click on product recall at the bottom of home page or click here for more information. Hazard: The snap can detach from the pacifier’s ribbon, posing a choking hazard for young children. Remedy: Consumer should immediately take the recalled holders away from young children and contact Handi-Craft for further instructions to receive a replacement product or comparable merchandise of equal or lesser value. Incidents/Injuries:The firm has received a total of 67 reports of the ribbon fraying and the snap detaching. No injuries have reported. Hazard: The fiberglass rod that supports the tent can break, splinter and become sharp, posing a laceration hazard to consumers. Incidents/Injuries:The firm has received 270 reports of tent rods breaking, including two reports of bruises and lacerations. Description: This recall involves the Playtime Pals Pop-Up Hideaway Hut animal themed children’s tent. The tent has four animal themes: hippo (pink), dog (brown), shark (blue) and tiger (orange). All have a fiberglass rod that springs to deploy the tent to shape and provides the support for the nylon shell. Sold At: Home Depot stores nationwide during November 2017 for about $13. Importer(s): Jewett Cameron Company, of North Plains, Ore. Distributor(s): Jewett Cameron Company, of North Plains, Ore. Remedy: Consumers should immediately stop using the recalled tents and return them to Home Depot for a full refund or store credit. Hazard: Improper wiring can activate the wagon’s motor unintentionally, posing an injury hazard. Incidents/Injuries:The firm has received two reports of the wagon’s motor activating unintentionally. No injuries have been reported. Description: This recall involves Radio Flyer’s eWagon children’s battery-operated electric wagons. When force is applied to the wagon’s electric handle, the motor activates to power the wagon. The foldable wagon is constructed of red and gray fabric and a steel frame and measures about 41 inches long, 25 inches wide, and 42 inches tall. The wagon has a removable canopy, two seats with seatbelts, four cup holders, a storage pouch, a removable battery and a telescoping handle where the power button is. The Radio Flyer logo is printed on each side of the wagon. Only wagons with model number 3912/3912A are included in this recall. The model number can be found on the handle warning label located near the pivoting joint. Sold At: Toys “R” Us stores nationwide and online at www.radioflyer.com and www.toysrus.com from August 2017 through January 2018 for about $350. Importer(s): Radio Flyer Inc., of Chicago, Ill. Remedy: Consumers should immediately stop using the recalled wagons and contact Radio Flyer for a full refund. Consumer Contact: Radio Flyer at 800-621-7613 from 8 a.m. to 5 p.m. CT Monday through Friday or online at www.radioflyer.com and click “Product Recalls” for more information. Hazard: The clamp attaching the mobile to the crib rail can break causing the mobile to fall, posing an injury hazard to an infant in the crib. Incidents/Injuries:Vtech has received six reports of the clamp cracking. No injuries have been reported. Description: This recall involves VTech Lights & Lullabies Travel mobiles. The recalled mobiles were sold in blue and pink. The model numbers are 80-503000 (blue) and 80-503050 (pink). The pink mobile was sold exclusively at Amazon.com. The mobile has a white and pink or white and blue plastic arm that clamps onto the side of a crib. It has three star attachments that hang from the top. The mobile has a music button that plays music, nature sounds and nursery rhymes. The mobile measures 5 inches wide by 15.8 inches tall.The model numbers are printed on the battery compartment door. Sold At: Kmart, Walmart and online at Amazon.com and zulily.com from February 2017 through November 2017 for about $25. Importer(s): VTech Electronics North America LLC, of Arlington Heights, Ill. Distributor(s): VTech Electronics North America LLC, of Arlington Heights,Ill. Remedy: Consumers should immediately stop using the recalled mobiles and contact Vtech for a full refund or a replacement product. Consumer Contact: VTech at 800-521-2010 from 8 a.m. to 7 p.m. CT Monday through Friday or online at vtechkids.com and click on Support for more information or register online at https://www.vtechkids.com/support/support_form. Hazard: The ears on the elephant rattles can break off, posing a choking hazard to young children. Description: This recall involves Vtech Shake and Sing Elephant rattle with model number 80-184800. The rattle has a purple elephant with yellow and blue ears at one end and a black and white plastic teething ring at the other end. VTech is stamped on the elephant. The rattle is about seven inches long and the number 1848 is printed on the back of the rattle adjacent to the battery door. The rattle sings when a button is switched on. Sold At: Walmart, Kmart, Meijer, Mills Fleet Farm, Seventh Avenue, and online at Amazon.com and zulily.com from November 2015 through November 2017 for about $8. Distributor(s): VTech Electronics North America LLC, of Arlington Heights, Ill. Remedy: Consumers should immediately stop using the recalled rattles and contact VTech for a full refund or credit for a replacement product. Consumer Contact: VTech at 800-521-2010 from 8 a.m. to 7 p.m. CT Monday through Friday or online at vtechkids.com and click on Support for more information or at https://www.vtechkids.com/support/support_form. Hazard: The center post on the fidget spinner can become loose or fall out, posing a choking hazard. Description: This recall involves Pokemon fidget spinner keychains. The keychains have a silver metal key ring with a metal bar attached to it with a Pokemon-themed fidget spinner on the end of the metal bar. The fidget spinner is red and white in the center and yellow around the outside. They measure about ½ inch high by 2 1/2 inches wide by 4 ½ inches long. Sold At: Bonita Marie Int., Gamestop, Wonderland stores and others nationwide and online at Amazon.com and other websites from September 2017 through November 2017 for between $7 and $10. Importer(s): Fashion Accessory Bazaar, of New York, N.Y. Distributor(s): Fashion Accessory Bazaar, of New York, N.Y. Manufacturer(s): Fashion Accessory Bazaar, of New York, N.Y. Remedy: Consumers should immediately stop using the recalled keychains and contact Fashion Accessory Bazaar for instructions on how to receive a full refund. Consumer Contact: Fashion Accessory Bazaar toll-free at 888-320-3299 any time, email at supportdesk@fabny.com or online at www.fabny.com and click on “Recall Information” for more information. Hazard: Mold can be present in the clay, posing a risk of respiratory or other infections in individuals with compromised immune systems, damaged lungs or an allergy to mold. Incidents/Injuries:The firm has received three reports of mold in the clay. No injuries have been reported. Description: This recall involves “totally me!” clay craft kits. Model number AD11244 is printed on the bottom of the box. The “totally me!” logo is printed on the front of the craft kit box. Sold At: Babies“R”Us and Toys“R”Us stores nationwide from January 2017 through October 2017 for about $10. Importer(s): Toys“R”Us Inc., of Wayne, N.J. Distributor(s): Toys“R”Us Inc., of Wayne, N.J. Remedy: Consumers should immediately stop using the recalled craft kits and return them to Babies“R”Us or Toys“R”Us for a full refund or store credit. Consumer Contact: Toys“R”Us at 800-869-7787 from 9 a.m. to 5 p.m. ET Monday through Friday or online at www.toysrus.com and click on Product Recalls for more information. Hazard: Babies can strangle on the side rope crossbars on the baby gyms. Description: This recall involves PlanToys baby gyms that are set on the floor for babies. Babies lay under the gym to play with the hanging mobiles. The wooden gyms are tan and have four legs with four different color balls in the middle that are connected by two ropes on the sides. There are two space-themed mobiles hanging from the top bar. The manufacturing date code TH 080116 through TH 082916 is printed on the top corner joint connecting ball. Sold At: Specialty toy and baby product stores nationwide and online at Diapers.com, Target.com and other websites from September 2016 through May 2017 for about $50. Importer(s): PlanToys Inc., of Union City, Calif. Distributor(s): PlanToys Inc., of Union City, Calif. Remedy: Consumers should immediately stop using the baby gyms and contact PlanToys for a free replacement baby gym. Consumer Contact: PlanToys toll-free at 866-517-7526 from 9 a.m. to 2 p.m. PT Monday through Friday, email at Michael@plantoysinc.com or online at www.PlanToys.com and click on Product Recalls for more information. Hazard: The metal post and/or handle of the wind-up mechanism can detach, posing a choking hazard to young children. Incidents/Injuries:The firm has received six reports of parts from the wind-up handle detaching from the toy. No injuries have been reported. Description: This recall involves Carter’s®, Child of Mine®, Guess How Much I Love You® and Just One You® brands of wind-up musical plush toys. The toys have a metal wind-up mechanism that can be turned to play music. They were sold in variety of animal characters and colors. The model number and batch code are printed on the smallest white sewn-in label behind the care label. Sold Exclusively At: Carter’s, Target, Walmart and other stores nationwide and online from January 2016 through August 2017 for between $11 and $20. Importer(s): Kids Preferred LLC., of East Windsor, N.J. Distributor(s): Kids Preferred LLC., of East Windsor, N.J. Remedy: Consumers should immediately stop using the recalled toys, take them away from young children and contact Kids Preferred for a free replacement toy. Consumer Contact: Kids Preferred toll-free at 888.968.9268 from 8:30 a.m. to 5 p.m. ET Monday through Friday, email at recall@kidspreferred.com or online at www.kidspreferred.com and click on “Product Safety” for more information. Hazard: The wiggle ball’s rubber knobs and plastic back can detach, posing a choking hazard to infants. Incidents/Injuries:There have been five reports of the metal bands wearing through the fabric covering of the bracelet resulting in cuts to hands or fingers. Description: This recall involves Bruin Infant Wiggle Ball toys also called a giggle ball. The blue ball has textured bumps for gripping and has orange, green and yellow rubber knobs around the ball. The ball wiggles, vibrates and plays three different musical tunes. It has an on/off switch and requires 3 AA batteries to operate. The recalled wiggle balls have model number 5F6342E and Toys “R” Us printed on the product. Sold Exclusively At: Babies “R” Us and Toys “R” Us stores nationwide from June 2016 through January 2017 for about $13. Importer(s): Toys “R” Us Inc., of Wayne, N.J. Distributor(s): Toys “R” Us Inc., of Wayne, N.J.
Consumer Contact: Toys “R” Us at 800.869.7787 from 9 a.m. to 5 p.m. ET Monday through Friday, or online at www.toysrus.com and click on Product Recalls for more information. Hazard: The metal band can wear through the fabric covering of the slap bracelet, posing a laceration hazard. Description: The recalled “slap bracelets” were included with "DreamWorks Trolls: It's Hug Time!" children's storybooks. The bracelet consists of an inner, flexible metal band wrapped in a purple fabric covering with a pink fabric flower. The ISBN for the book is 978-0-7944-3840-1 and is printed on the back of the book. Sold At: Book and other retail stores nationwide, book fairs and clubs, and online at Amazon.com, Barnesandnoble.com, Walmart.com and other online retailers from September 2016 through August 2017 for about $13. Consumer Contact: Studio Fun International at 800.489.3402 from 8 a.m. to 4:30 p.m. CT Monday through Friday, or online at www.studiofun.com and click on “Product Recall” for more information. Hazard: The toys have fabric hats and bows that can detach, posing a choking hazard. Incidents/Injuries:Hallmark has received one report of the toy’s fabric bow detaching. No injuries have been reported. Description: This recall involves the itty bittys baby Disney-licensed plush animal stacking toys with rattling rings. The toys measure 10 inches by 7.5 inches by 9.5 inches. They have a yellow base stand with a post and four rattling rings that slide on and off the post. The red, blue, pink and purple rings have Mickey Mouse and Minnie Mouse, and Donald Duck and Daisy Duck characters attached to them. Three of the four Disney-licensed characters are wearing a small plush, fabric hat or bow. The Hallmark logo and “itty bittys” are printed on a sewn-on tag attached to the toy’s base. Sold At: Hallmark Gold Crown stores nationwide and online at Hallmark.com and Amazon.com from June 2016 through July 2017 for about $30. Importer(s): Hallmark Marketing Company LLC, of Kansas City, Miss. Distributor(s): Hallmark Marketing Company LLC, of Kansas City, Miss. Consumer Contact: Hallmark at 800-425-5627 from 9 a.m. to 8 p.m. ET Monday through Friday or online at www.hallmark.com and click on Product Recalls at the bottom of the page for more information. Hazard: The wooden rings on the hammer rattles can crack, posing a choking hazard to children. Incidents/Injuries:BRIO has received seven reports of the wooden ring cracking. No injuries have been reported. Description: This recall involves BRIO soft hammer baby rattle toys. They have a wooden handle with a white plastic teething ring at one end and a red, yellow, white and green hammer head at the other end. BRIO is stamped on the hammer head. The rattle is about 5 inches long. Sold At: Home Goods, Kidding Around, Nordstrom and other specialty toy and mass retailer stores nationwide and online at Amazon.com, from March 2015 through June 2017 for about $13. Distributor(s): Ravensburger North America, of Newton, N.H.
Consumer Contact: BRIO, through North American distributor Ravensburger, at www.brio.us and click on Recalls at the bottom of the page or call 800-886-1236 from 8:30 a.m. to 5 p.m. Monday through Friday for more information. Hazard: The building sets corner welds can break, allowing the panels and frames to separate and release magnets during play. When released, exposed magnets can create a choking hazard. Description: This recall involves two styles of Panelcraft™ Rainbow magnetic building sets: Rainbow Dream Builder and Rainbow Solid Builder. The solid builder set includes 19 pieces: 11 solid panels in red, yellow, green, blue and purple and 8 white windows that measure 9 inches by 9 inches. The rainbow dream builder set includes 19 windows in red, yellow, green, blue and purple colors that measure 9 inches by 9 inches. Sold At: Discount School Supply, Kaplan Early Learning Company, Panelcraft and Tout About Toys from November 2016 through January 2017 for between $120 and $150. Importer(s): Panelcraft Inc., of Dearborn, Mich. Distributor(s): Panelcraft Inc., of Dearborn, Mich.
Consumer Contact: Panelcraft toll-free at 888-288-7615 from 8 a.m. to 5 p.m. ET Monday through Friday or online at www.panelcraft.com and click on Contact Us for more information. Hazard: The colored plastic tubes on the product can become brittle and break into small pieces, posing a choking hazard to infants. Incidents/Injuries:The firm has received four reports of plastic tubes breaking. No injuries have been reported. Description: TheWinkel Colorburst teething and activity toy has multi-color plastic tubing inserted into a plastic cube with rattle beads inside. The model number and lot code are printed on the center of the cube and on the hang-tag and product packaging near the UPC code. Only activity balls with the following lot codes are included in this recall: 206880 DH; 206880 EH; 206880 HH; 206871 EH. Sold At: Toy stores nationwide and online at www.manhattantoy.com and other websites from May 2015 through September 2016 for about $15. Importer(s): The Manhattan Toy Company LLC, of Minneapolis, Minn. Retailer: The Manhattan Toy Company LLC, of Minneapolis, Minn. Remedy: Consumers should immediately take the recalled toys away from infants and return it to the store where purchased or contact Manhattan Toy for a full refund. Consumer Contact: The Manhattan Toy Company at 800-541-1345 from 8 a.m. to 5 p.m. CT Monday through Thursday and 8 a.m. to 12 p.m. CT Fridays, or online at www.manhattantoy.com and click on Recalls at the bottom of the page for more information. Hazard: Parts inside the toy can break creating a sharp point that can penetrate the surface of the toy, posing a laceration hazard. Incidents/Injuries:TOMY International has received one report of a minor laceration injury to a child’s hand. Description: This recall involves Lamaze Munching Max chipmunk stuffed toys with item number L27578. “Tomy,” “Lamaze” and the item number are printed on a sewn-in fabric label near the tail of the toy. The stuffed toy is multi-colored with a white clip on the head of the chipmunk. When the clip is pulled, the chipmunk toy vibrates and simulates eating the cloth nut attached to its arm. Sold At: Babies R Us, Toy R Us and other retail stores nationwide and online at Amazon.com from May 2016 through July 2017 for about $16. Importer(s): TOMY International Inc., of Oak Brook, Ill.
Consumer Contact: TOMY International toll-free at 866-725- 4407 from 7:30 a.m. to 4:30 p.m. CT Monday through Thursday and 7:30 a.m. to noon Friday or online at http://recall.tomy.com. Consumers can also visit www.tomy.com and click on Recalls for more information. Hazard: The battery cover can detach and expose the small coin cell batteries, posing choking and ingestion hazards to young children. Incidents/Injuries:Hobby Lobby has received one report of a 14-month-old child who ingested the battery. An x-ray was conducted and the battery passed through. Description: This recall involves Pulse Krusher Pro Freestyle scooters with factory code 083WY, item number 164257 and date code 10-8-2016 or earlier. The factory code, item number and date code can be found on a label printed on the underside of the scooter deck. The 30-inch high scooters were sold in blue and have the words “PULSE PERFORMANCE PRODUCTS” printed on the down tube. Sold At: Hobby Lobby and Mardel stores nationwide from February 2017 to April 2017 for about $5. Importer(s): Hobby Lobby Stores Inc., of Oklahoma City, Okla.
Consumer Contact: Hobby Lobby Stores at 800-326-7931 between 9 a.m. and 6 p.m. ET Monday through Friday, or online at www.hobbylobby.com and click on the Recall tab for more information. Hazard: The acceleration pedal on the ride-on toys can stick, posing fall and crash hazards. Incidents/Injuries:Dynacraft has received 19 reports of pedals sticking, including seven reports of minor injuries; abrasions, cuts and bruises. Description: This recall involves three models of 12V battery-operated ride-on toys, including Surge 12V Camo 4X4, Surge 12V XL Quad and Tonka 12V Mighty Dump trucks. The model number, batch number, serial number and the date code , formatted as “MMDDYYYY,” are printed on a label on the bottom of the ride-on toy. Sold At: The Surge 12V Camo 4X4 was sold at Walmart nationwide between June 2016 and March 2017 for about $300. The Surge 12V XL Quad sold at Academy Sports + Outdoors stores nationwide from September 2016 through March 2017 for between $150 and $200. The Tonka 12V Might Dump Truck was sold at Toys R Us stores nationwide and online at ToysRUs.com from July 2016 through November 2016 for about $350. Importer(s): Dynacraft BSC Inc., of American Canyon, Calif. Distributor(s): Dynacraft BSC Inc., of American Canyon, Calif.
Consumer Contact: Dynacraft at 800-551-0032 from 7 a.m. to 4 p.m. PT Monday through Friday or online at www.dynacraftwheels.com and click on “Product Recalls” for more information. Hazard: The plastic eyes on the plush toys can detach, posing a choking hazard. Incidents/Injuries:Douglas has received two reportsof the plastic eyes detaching or loosening. No injuries have been reported. Sold At: Specialty toy and gift stores nationwide from July 2014 to April 2017 for about $20. Also distributed byUnitedHealthcare Children’s Foundation (UHCCF) to various individuals and organizations. Importer(s): Douglas Company Inc.,of Keene, N.H.
Consumer Contact: Douglas at 800-276-4029 from 9 a.m. to 7 p.m. ET Monday through Friday or online at www.douglastoys.com and click on Product Recall for more information. Hazard: If the small toy is ingested, it can expand inside a child's body and cause intestinal obstructions, resulting in severe discomfort, vomiting, dehydration and could be life threatening. Surgery is required to remove the toy from the body, if ingested. Medical professionals and parents should be aware that there is a possibility that the toys might not show up on an x-ray. Description: This recall involves Hatch & Grow Easter Eggs, Easter Grow Toys and Hatch Your Own Dino. Hatch & Grow Easter Eggs and Easter Grow Toys have model number 234-25-1200 on the back of the product’s packaging. Hatch Your Own Dino Egg has model number 234-09-0016 on the label inserted in the product’s packaging. The pink, blue, or purple Hatch & Grow Easter Eggs include a white bunny, brown bunny, or butterfly. The Easter Grow Toys include a yellow chick, brown bunny, or white bunny. The Hatch Your Own Dino Eggs are purple or yellow/green and contains one of eleven dinosaurs. Sold Exclusively At: Target stores nationwide from February 2017 through March 2017 for about $1. Consumer Contact: Target at 800- 440-0680 between 7 a.m. to 8 p.m. CT Monday through Sunday, online at www.target.com and click on “Recalls” at the bottom of the page, then on “School/Stationery/Seasonal” for more information, or the “Product Recalls” tab on Target’s Facebook page. Hazard: The toy trolleys can tip backwards, posing an impact injury hazard to children. Incidents/Injuries:Juratoys has received two reports of trolleys falling backwards, both resulting in ER visits. One involved a tooth extraction the other a laceration to the child’s nose. Description: This recall involves four Bricolo by Janod® -push toy trolleys. The French Cocotte Cooker trolley is red with orange wheels and includes a cooktop with fried egg shapes, an oven and eight accessories, including pots and pans “Janod” printed on the side and front of the trolley and J06544 printed on the base of the toy. The DIY-Magnetic trolley is gray and black with red wheels with work station and tools. “Bricolo” is printed on the front of the DIY-Magnetic trolley and J06505 is printed on the base of the toy. The Redmaster-Magnetic DIY trolley is black and gray with red wheels and 21 accessories, including three magnetic tools and a set of gears. J06493 is printed on the base of the toy. The Barbecue trolley is brightly colored and comes with a magnetic spatula, magnetic barbecue fork, one piece of pork, two sausages, one fish, one piece of beef, and three tomatoes. J06523 is printed on the base of the toy. The trolleys measure approximately 17 inches tall and have a 1 foot by 1 foot base. Sold at: Various toy stores nationwide including Giggle and Saks Fifth Avenue, and online at Zulily.com from September 2012 to March 2017 for about $100. The Janod Barbecue trolley sold for about $70. Importer(s): Juratoys U.S. of Fairfield, N.J.
Consumer Contact: Juratoys toll free at 877-277-1663 from 8:30 a.m. to 5 p.m. ET Monday through Friday, or online at www.janod.com and click on “Product Recall” under the “Janod Express” tab at the top of the page for more information. Hazard: The clear plastic disc on the outside of the ball can break, releasing small beads, posing a choking hazard to young children. Incidents/Injuries:The firm has received 42 reports of the plastic disc breaking releasing small beads including two reports of beads found in children’s mouths and three reports of gagging. Description: This recall involves Oball Rattles in pink, blue, green and orange with model number 81031 printed on the inner surface of one of the plastic discs and on the packaging. The balls have 28 finger holes and measure four inches in diameter. Embedded in the rattles are a clear plastic disc with all orange beads and two clear plastic discs with beads of varying colors on the perimeter. Only rattles with date codes T0486, T1456, T2316, T2856 and T3065 located on a small triangle on the inner surface of the rattle are included in the recall. The first three numbers represent the day of the year and the last digit represents the year of production. Sold at: Target, Walgreens, Walmart and other retailers nationwide and online at Amazon.com, Babyhaven.com, Diapers.com, ToysRUs.com, Walgreens.com and other online retailers from January 2016 through February 2017 for between $5 and $7. Importer(s): Kids II Inc., of Atlanta, Ga.
Consumer Contact: Kids II toll-free at 877.243.7314 from 8 a.m. to 5 p.m. ET Monday through Friday or visit www.kidsii.com and click on “Recalls” at the bottom of the page for more information. Hazard: When the button batteries are removed from the toy frogs, the battery’s cap can become a projectile and the battery’s chemicals can leak, posing chemical and injury hazards. Incidents/Injuries:The firm has received 17 reports of the battery’s cap becoming a projectile or battery chemicals leaking, including two injuries that resulted in emergency room and doctor’s office visits for eye irritation from the battery chemicals. Description: This recall involves the Little Live Pets Lil Frog plastic toys. They operate with four button batteries and jump. Little Live Pets Lil Frog has SKU: 28217 and Lil Frog Lily Pad has SKU: 28218 printed on the frog’s lower belly near its left thigh with a manufacture date code under it. The date code range is WS112016 to WS123216. The toy frogs were sold in pink, blue and green colors. Sold at: AAFES, Target, Toys “R” Us and Walmart stores nationwide and online at Amazon.com from August 2016 through February 2017 for about $15 for the Lil Frog and $25 for the Lil Frog Lily Pad. Importer(s): Regal Logistics, of Fife, Wash.
Consumer Contact: Moose Toys toll-free at 844.575.0340 from 8 a.m. to 5 p.m. Monday through Friday PT or online at www.moosetoys.com and click on “Product Safety” for more information. Hazard: The top component can detach and expose an eight inch metal rod, posing an injury hazard to young children. Description: This recall involves light-spinner wands with lot numbers 954544 and 954603 imprinted on the bottom of the toy. The light-spinner wands have either Mickey Mouse or Minnie Mouse at the top. The Mickey Mouse wands are yellow, red and black. The Minnie Mouse wands are pink, white and blue. The wands measure about 18 inches tall. Sold Exclusively At: Disney On Ice and Disney Live shows from October 2016 through November 2016 for about $22. Importer(s): Feld Entertainment Inc., of Vienna, Va. Distributor(s): Feld Entertainment Inc., of Vienna, Va.
Consumer Contact: Feld Entertainment at 800.755.1530 or 703.448.3683 from 9 a.m. to 5 p.m. ET Monday through Friday, email at Recall@feldinc.com and online at www.feldentertainment.com and click Recall for more information. Hazard: The wheels on the mobile’s hanging cars can detach and fall, posing a choking hazard to young children. Incidents/Injuries:RH has received one report of a wheel detaching from the mobile. No injuries have been reported. Description: This recall involves RH Baby & Child vintage race car mobiles. The recalled mobiles are used as decorative items that hang from the ceiling. The mobiles contain six wooden cars in various colors with spinning axles and wooden wheels attached to the axles. Sold Exclusively At: RH Baby & Child stores nationwide and online at RHBabyandChild.com from October 2014 through October 2016 for about $50. Importer(s): Restoration Hardware (RH), of Corte Madera, Calif.
Consumer Contact: RH toll-free at 888-728-8419 from 8 a.m. to 5 p.m. PT Monday through Friday or online at www.RH.com and click on Safety at the bottom of the page for more information. Description: This recall involves Joyrider three-wheeled scooters for children. They have a low, foot-gripping deck, multicolored handgrips, and an adjustable metal T-bar handle. The scooters are made of metal and plastic and come in a variety of colors. The tracking label sticker can be found on the back of the scooter, with batch PO number of G20140423. Recalled model numbers are: GT5048R, GT5110R, GT5121R, GT5124R, GT5125R, GT5122R, GT5117R, GT5123R. Model numbers can be found on the bottom of the scooter base, on the receipt and on the packaging. Sold At: Online at Amazon.com from October 2014 through January 2016 for about $80 and at Zulily.com from June 2014 through July 2015 for about $50. Manufacturer(s): Glopo Inc, South El Monte, Calif.
Consumer Contact: GLOPO toll-free at 855-965-1704 from 9 a.m. to 5 p.m. PT Monday through Friday or online at www.GlopoUsa.com and click on “Online Form” for more information. Hazard: The toys contain small eggs and the chicken can break into small plastic pieces, both posing a choking hazard to children. Description: This recall involves the Bump 'N Go Walking Egg Laying Chicken with light, sound and music. The battery-powered plastic toy is a yellow chicken with an orange head and orange wings. The chicken toy includes three white plastic eggs that are placed into the back of the chicken and then released from the bottom. The chicken measures 7 inches wide by 6 inches tall by 7 inches deep. The eggs measure one inch wide by one inch tall by one inch deep. “QQ Chicken” is printed on the wing. A small yellow chicken sits on the chicken’s back. Sold At: Online at Amazon.com and Bingo Deal’s website www.prextex.com from July 2015 through June 2016 for about $20. Consumer Contact: Bingo Deals toll-free at 888-429-1679 from 10 a.m. to 5 p.m. ET Monday through Thursday and from 10 a.m. to 12 p.m. ET on Friday, email Recall@prextex.com or at Bingo Deal’s website www.prextex.com and click on Recall Safety at the top of the page. Incidents/Injuries:Peg Perego has received three reports of the children’s ride-on toy vehicles overheating, including one report of a burn. Sold Exclusively At: Online retailers including Amazon.com, Cabelas.com, Target.com, ToysRUs.com and Wal-Mart.com from October 2014 through April 2016 for between $500 and $600. Manufacturer(s): Peg Perego USA, of Fort Wayne, Ind. Consumer Contact: Peg Perego toll-free at 877-737-3464 from 8 a.m. to 5 p.m. ET Monday through Friday, email at 850recall@pegperego.com or online at us.pegperego.com and click on Customer Service and then on Recalls for more information. Sold Exclusively At: Target stores nationwide from August 2016 through September 2016 for about $1. Consumer Contact: Target at 800-440-0680 from 7 a.m. to 8 p.m. CT Monday through Sunday, online at www.Target.com and click on “School/Stationery/Seasonal” on the product recalls page for more information, or the “Product Recalls” tab on Target’s Facebook page. Incidents/Injuries:There have been 22 reports of the ends of small parts detaching from the building sets. No injuries have been reported. Hazard: The fabric discs on the tentacles of the octopus rattles can detach, posing a choking hazard to young children. Incidents/Injuries:The firm has received five reports of the rattle’s fabric discs detaching. No injuries have been reported. Description: This recall involves The Land of Nod’s Octo-rattles, sold individually or as part of a gift bag set. The knit fabric rattles are yellow and shaped like an octopus with multi-colored felt discs sewn into the tentacles. The rattles measure about 9 inches tall, 4 inches wide and 3 inches deep and can attach to strollers or activity gyms. “The Land of Nod,” “Morton Grove, IL 60053,” “951-3072461,” “Made in India” and SKU number 502882 are printed on a label attached to the underside of the rattle. Sold exclusively at: The Land of Nod stores nationwide and online from September 2015 through April 2016 for about $30 for the individual rattle and for $150 as part of a gift bag set. Distributor(s): The Land of Nod, of Morton Grove, Ill. Remedy: Consumers should immediately take the recalled rattles away from children and contact The Land of Nod to receive a full refund. Consumer Contact: The Land of Nod at 800-933-9904 from 8:30 a. m. to 5 p.m. CT Monday through Friday or online at www.landofnod.com and click on Product Recalls at the bottom of the page for more information. Incidents/Injuries:The firm has received 35 reports of charging cords overheating. No injuries have been reported. Description: This recall involves yellow USB charging cords sold with Aero Spin and Aero Cruz Sky Rover remote-controlled flying toys. The toy is shaped like ball with two blades on top, wings on the side and measures about 3 ½ inches tall by 5 inches wide. They are operated by a small one-channel remote control unit. The following item numbers are included in the recall: YW859110-2, YW859110-3, YW859110-5, YW859110-6 or TTYW859110-5. The item number is printed on a white sticker on the toy’s packaging. They were sold in red, orange and citron green. Only yellow USB charging cords are included in this recall. Sold at: Walmart and other mass merchandisers and independent toy stores nationwideand online at Amazon.com from January 2015 through January 2016 for between $11 and $15. Importer(s): Auldey Toys North America, of Quincy, Mass. Hazard: The “Slider Bracelet” in the jewelry making kit contains high levels of lead. Lead is toxic if ingested by young children and can cause adverse health issues. Sold at: Kmart, Toys R Us, Walmart and other retailers sold the Shimmer N’ Sparkle Cra-Z-Art Cra-Z-Jewelz Gem Creations Ultimate Gem Machine from August 2015 through April 2016 for $30. Toys R Us, Walmart and other retailers sold the Shimmer N’ Sparkle Cra-Z-Art Cra-Z-Jewelz Gem Creations Gem Charm and Slider Bracelets from August 2015 through April 2016 for $10. Target stores sold the My Look Cra-Z-Art Cra-Z-Jewelz Gem Creations Ultimate Gem Machine from August 2015 through April 2016 for $30. Importer(s): LaRose Industries, of Randolph, N.J. and Target Corp., of Minneapolis, Minn. Distributor(s): LaRose Industries, of Randolph, N.J. and Target Corp., of Minneapolis, Minn. Remedy: Consumers should immediately take these recalled products away from children and contact LaRose for instructions to receive a full refund. Consumer Contact: LaRose Industries toll-free at (855) 345-4693 between 8:30 a.m. and 5:30 p.m. ET Monday through Friday, email recall@laroseindustries.com or online at www.laroseindustries.com and click on the Recall tab more information. Description: This recall involves Little Wishes Chenille Stuffed Rattles, including the Pink & Green Fish rattles, item number 5141577, and the Blue & Yellow Fish rattles, item number 5127642. The rattles are made of a soft chenille fabric with a fiber stuffing. They are 8.5 inches by 7 inches and have a hole cut out in the middle. The item number is printed on the top left corner of the product hang tag. Rattles have a sewn-in label with “Reg. No. PA-15130(CN)” and “Hobby Lobby 9123069” printed on the front of the label. Sold exclusively at: Hobby Lobby Stores nationwide from January 2016 through April 2016 for about $7. Remedy: Consumers should immediately stop using the recalled rattles and return them to the nearest Hobby Lobby store for a full refund or store credit. Consumer Contact: Hobby Lobby Stores at 800-326-7931from 9 a.m. to 6 p.m. ET Monday through Friday, or online at www.hobbylobby.com and click on the “Recall” tab at the bottom of the page for more information. Hazard: Parts of the wooden toys can become detached, resulting in small pieces that can pose a choking hazard to young children. Description: This recall involves Flying Tiger Copenhagen wooden blocks and wooden giraffe toys. The Twist & Lock blocks were sold in a combination of blue, green and yellow and red, pink and yellow. Item number 1701354 is printed on the packaging for the blocks. The Twist & Lock giraffe toys were sold in pink and red combination and a yellow and orange combination. Item number 1701493 is printed on the packaging for the giraffe. Sold exclusively at: Flying Tiger Copenhagen in New York from November 2015 through December 2015 for about $3. Remedy: Consumers should immediately take the recalled toys from young children and return the products to Flying Tiger Copenhagen for a full refund. Consumer Contact: Flying Tiger Copenhagen toll-free at 844-350-0560 from 7:30 a.m. to 5 p.m. ET Monday through Friday or online at www.flyingtiger.com and click on “Product Recalls” at the bottom of the page. Hazard: The red button on the Moogy plush toy’s left pocket can detach, posing a choking hazard to young children. Description: This recall involves Moogy plush fastening toys for toddlers between 12 and 36 months of age. The toy has zippers, buttons, buckles and laces. The Moogy toy has a blue and green face, red ears, a blue jacket with a red zipper, pink/red striped pants and pink and orange shoes with polka dots. Moogy measures about 18 ½ inches tall. “Miniland,” item number R.96295 and lot number 0115 1402813 085 are printed on a white tag sewn into the toy’s pants. Sold at: Specialty toy stores nationwide and online at Amazon.com, Gilt.com, HighlightsforChildren.com, ToysRUs.com and Zulily.com from July 2015 through February 2016 for about $33. Importer(s): Miniland Educational Corp., of Miami, Fla. Distributor(s): Miniland Educational Corp., of Miami, Fla. Remedy: Consumers should immediately take the recall toy away from children and contact Miniland Educational for instructions on cutting off the button to remove the hazard in order to receive a full refund. Consumer Contact: Miniland Educational toll-free at 866-201-9069 from 8 a.m. to 5 p.m. ET Monday through Friday, or online at www.minilandeducationalusa.com and click on “Products,” then on “Safety Information” in the dropdown menu for more information. Hazard: The fabric hook and loop fastener at the neck of the bat cape can fail to detach readily during use, posing a strangulation hazard to children. Incidents/Injuries: IKEA has received three reports outside of the United States of the fabric hook and loop fastener at the neck of the costume failing to detach readily and scratching children’s necks. Description: This recall involves IKEA children’s bat cape costumes. The capes are black with gray stripes, 100% polyester, measure 30 inches long by 57 inches wide and have a fabric hook and loop fastener closure at the neck. IKEA, LATTJO and numbers 60311650 and 18937 are printed on a white label sewn into the seam of the cape. Sold exclusively at: IKEA stores nationwide and online at www.ikea-usa.com from November 2015 through February 2016 for about $13. Importer(s): IKEA North America Services LLC, of Conshohocken, Pa. Distributor(s): IKEA North America Services LLC, of Conshohocken, Pa. Remedy: Consumers should immediately take the recalled bat capes away from children and return the capes to any IKEA store for a full refund. Consumer Contact: IKEA toll-free at 888-966-4532 anytime or online at www.ikea-usa.com and click on Press Room at the bottom of the page, then Product Recalls for more information. Hazard: The round plastic beads can break, posing a choking hazard. Incidents/Injuries: The firm has received two reports of beads breaking off the toy. No injuries have been reported. Description: Busy Loops table top toys have orange, green, blue and purple plastic tubing with plastic beads threaded on the tubing that can slide up and down. The tubes sit on a blue plastic base with an orange plastic suction cup. The toy is about 4.5” W x 4.5” L x 7” H. The model number 700470 and lot code FH are printed on the bottom of the blue base. Sold at: BuyBuy Baby and other toy stores nationwide, and online at Amazon.com and Kohls.com from September 2015 through January 2016 for about $15. Remedy: Consumers should immediately stop using the recalled toy and return it to the store where it was purchased or contact Manhattan Toy for a full refund. Consumer Contact: Manhattan Toy Company at 800-541-1345 from 9 a.m. to 5 p.m. CT Monday through Friday or online at www.manhattantoy.com and click on Recalls for more information. Hazard: The pink metal note bar on the glockenspiel may contain excessive levels of lead in the paint, violating the federal lead paint standard. If the paint is scraped off and ingested lead can cause adverse health effects. Description: The Green Tones 8-note Monkey Glockenspiel is a children’s musical instrument with eight metal bars in multiple colors mounted on a wooden base shaped like a monkey. The bars are individually attached to the base with one screw at each end. The second bar from the top is pink, 3.5 inches long and has a “B” stamped on it. This is the bar that needs to be replaced. The Green Tones logo is stamped on the back of the glockenspiel and the tracking number HS0178410914 is printed in black at the bottom. Sold at: Independent toy and music retailers and online at amazon.com and gogreentones.com from January 2015 through September 2015 for about $40. Remedy: Consumers should immediately remove the pink bar from the glockenspiel and contact KHS America for information on getting a free replacement pink bar. Consumer Contact: KHS America Green Tones at 800-283-4676 from 8:30 a.m. to 4:30 p.m. CT Monday through Friday or online at www.gogreentones.com and click on “Contact Us” for more information. Sold at: Dollar General stores nationwide and online at www.dollargeneral.com from July 2015 through December 2015 for about $10. Importer(s): Dollar General Corp., of Goodlettsville, Tenn. Distributor(s): Dollar General Corp., of Goodlettsville, Tenn. Hazard: The rubber ball on the drumsticks can detach or be unscrewed, posing a choking hazard. Incidents/Injuries:IKEA has received six reports of the rubber ball on the end of the drumsticks detaching or being unscrewed. These reports were from staff in IKEA stores in Germany, Denmark, Spain and the Netherlands. No incidents or injuries have been reported in the United States. Description: The recall includes LATTJO Tongue Drum and LATTJO Drumstick set. The LATTJO Tongue Drum is a solid birch rectangular-shaped drum with a turquoise-dot print on the front and two solid red circles on top. The drum measures about 8 inches long by 2-3/4 inches wide by 2-3/4 inches deep. The drum comes with a seven inch mallet with a turquoise painted handle and black rubber ball on the end. IKEA and LATTJO are printed on a label on the bottom of the drum. The LATTJO Drumstick set includes two solid birch drumsticks, two brushes and two mallet-type drumsticks with black rubber balls on the ends. The set was sold in a turquoise polyester roll-up pouch with a red and white striped fabric panel in the center. The pouch measures about 15 inches long by 10 inches wide. IKEA and LATTJO was printed on a label attached to the pouch. Sold at: IKEA stores nationwide and online at www.ikea-usa.com from November 2015 through December 2015 for about $10 for the LATTJO tongue drum and $15 for the LATTJO drumstick set. Remedy: Consumers should immediately take the recalled drum and drumstick sets away from children and return them to IKEA for a full refund. Consumer Contact: IKEA toll-free at 888-966-4532 anytime or online at www.ikea-usa.com and click on Press Room at the bottom of the page then Product Recalls at the top of the page for more information. Hazard: The strap attaching the product to the crib rail can break, posing an injury hazard if the product falls on the infant in the crib. Incidents/Injuries:Skip Hop has received 8 reports of the strap attaching the mobile to the crib breaking. No injuries have been reported. Description: This recall includes the Skip Hop Moonlight & Melodies projection crib mobiles. The mobile has a white plastic arm that attaches to the side of a crib with four blinking, glowing leaves with stuffed animal attachments. The mobile also has a projector on the top of the mobile that projects stars on the ceiling and plays eight nursery lullabies. The dangling stuffed animals on the mobile include a yellow and gray giraffe, a green turtle with a gray and white polka-dot shell, a brown and tan monkey and a gray and white striped owl. The mobiles measure 17.5 inches long by 14 inches wide by 22 inches tall. SKIP HOP and the model number 185509 are printed on the back of the mobile base. Sold at: Babies R Us, Buy Buy Baby and other independent juvenile specialty stores nationwide and online at Amazon.com and skiphop.com from July 2015 to November 2015 for about $65. Remedy: Consumers should immediately stop using the recalled mobiles and contact the firm for instructions on receiving a $75 coupon towards the purchase of a new Skip Hop product. Consumer Contact: Skip Hop toll-free at 877-475-4746 from 9 a.m. to 5 p.m. ET Monday through Friday, by email at customerservice@skiphop.com or online at www.skiphop.com and click on “Safety Notices” at the bottom of the page under “Customer Care” for more information. Hazard: The toy’s blue hubcaps can detach from the wheel’s axle, posing a choking hazard to young children. Sold at: Target stores nationwide from July 2015 through August 2015 for about $40. Manufacturer(s): LaRose Industries, of Randolph, N.J. Remedy: Consumers should immediately take the recalled ride-on toys away from children and return the product to any Target store for a full refund. Consumer Contact: Target at 800-440-0680 from 7 a.m. to 8 p.m. CT Monday through Friday, or online at www.target.com, click on Product Recalls at the bottom of the homepage under the Help section. Consumers can also click on the Product Recalls tab on Target's Facebook page for more information. Consumers can also visit LaRose's website at www.cra-z-art.com and click on the Product Recall tab at the bottom of the page. Hazard: The satin seam of the stuffed animal can open, allowing the stuffing material to be exposed, posing a choking hazard for young children. Description: Starbrights Dragon is covered in a blue furry fabric with silver satin tummy, feet pads, wings and horns. The horns light up and the toy makes a musical sound when the hand is squeezed. The stuffed animal is about 17 inches high. The tracking label ending with 9333 or 9334 for USA and 9337 or 9459 for Canada can be found on the label sewn on the backside of the leg. Sold at: Build-A-Bear Workshop stores and online at www.buildabear.com between April 2015 and August 2015 for about $25. Remedy: Consumers should immediately take the recalled stuffed animal away from children and return it to any Build-A-Bear Workshop store to receive a coupon for any Build-A-Bear stuffed animal. Consumer Contact: Build-A-Bear toll-free at 866-236-5638 from 8 a.m. to 8 p.m. CT Monday through Friday, from 9 a.m. to 6 p.m. CT on Saturday and from 10 a.m. to 7 p.m. CT on Sunday; email ProductHotline@buildabear.com or go to www.buildabear.com and click on Product Recall at the bottom of the page for more information. Hazard: The yarn from the sheep figures can unravel, posing an entanglement and strangulation hazard to young children. Incidents/Injuries: The Land of Nod has received three reports of the sheep's yarn unraveling. No injuries have been reported. Description: This recall involves The Land of Nod Follow the Herd mobile. The recalled mobile is made of white wool felt and has five sheep figures made of white wool yarn. The sheep have black felt eyes and brown felt ears. The mobile is about 24 inches tall, 10 inches wide and 10 inches deep. SKU number 198234 is on a label attached to the body of the mobile. Sold at: The Land of Nod stores nationwide and online at www.landofnod.com from September 2013 through May 2015 for about $50. Remedy: Consumers should immediately put the recalled mobiles out of the reach of children and contact The Land of Nod for a full refund. Consumer Contact: The Land of Nod at 800.933.9904 from 8:30 a.m. to 5 p.m. CT Monday through Friday or online at www.landofnod.com and click on Product Recalls at the bottom of the page for more information. Hazard: The plastic worm at the end of the fishing pole line can separate, producing small parts that pose a choking hazard to children. Additionally, the small magnet inside the worm can liberate. Swallowing multiple magnets can result in serious internal injury. Incidents/Injuries: The firm has received about 417 reports of the plastic worm at the end of the fishing pole line separating and releasing small parts, including four reports of children ingesting a small part. No injuries have been reported. Sold at: Online at www.citruslane.com, www.burrogoods.com, www.terratoys.com, www.patinastores.com; numerous retail stores including Patina, Burro, and Terra Toys; and at Juratoys trade shows from April 2015 through August 2015 for approximately $15 to $20. Importer(s): Juratoys U.S. of Fort Lauderdale, Fla. Remedy: Consumers should immediately stop using the recalled games and keep them out of the reach of young children. Consumers should contact Juratoys for a prepaid shipping envelope to return the game. Juratoys will then send a $15 refund check for the Sardines game and a $20 refund check for the Starfish game. Consumers who paid more should include a receipt in the return to receive a full refund. Consumer Contact: Juratoys U.S. toll-free at 877-271-0440 from 8:30 a.m. to 5 p.m. ET Monday through Friday or online at www.juratoysus.com or www.janod.com and click on the “Product Recall” link at the bottom of the page for more information. Hazard: The wooden ring can break into small pieces, posing a choking hazard to young children. Incidents/Injuries: Manhattan Group has received one report of the wooden ring breaking. No injuries have been reported. Description: This recall involves theMy Snuggly Ellie Activity Toy. The toy is a plush brown elephant with white crinkle ears. There is a green hanging loop on top of its head allowing it to be a stroller or crib attachment. On the stomach there is a mini mirror while a teether and wooden ring hang below its body. The item number is 212520 and can be found on the small white tag sewn into the bottom of the toy. Importer(s): Manhattan Group LLC, of Minneapolis, Minn. Remedy: Consumers should immediately take the toy away from young children and return the toy to where it was purchased for a full refund. Consumer Contact: Manhattan Group toll-free at (800) 541-1345 between 8 a.m. and 5 p.m. CT Monday through Friday, or visit the firm’s web site at www.manhattantoy.com and click on “RECALLS” for additional information. Hazard: The red paint on the Little Digger toy frame contains excessive levels of lead, which is prohibited under federal law. Description: This recall involves Wel-Bilt brand Little Diggers, Item # 28303. It is a stationary scooper toy with moveable poles that allow the child to scoop items up into the bucket. The item has a red powder-coated steel frame with a black plastic seat and black adjustable scoop with two yellow plastic grips on the poles and a six-sided frame base. The measurements are about 17 inches high and 25 inches wide. It has a manufacture date of August 2014 through June 2015.Wel-Bilt is printed on the front of the bucket and the manufacture date is written on the tracking label located on the bucket. The item number #28303 is printed only on the toy’s packaging. Sold at: Northern Tool + Equipment retail stores and catalogs and online at www.amazon.com, www.kotulas.com and www.northerntool.com from August 2014 through June 2015 for about $30. Remedy: Consumers should immediately stop using the Little Digger Toy, put it out of reach of children and contact the firm for a full refund. Hazard: Hub caps on the wheels can break or come off the wheel, posing a choking hazard for young children. Incidents/Injuries: No incidents have been reported. Importer(s): Bunnies by the Bay of East Windsor, N.J.
Consumer Contact: Bunnies by the Bay toll-free at (866) 763-8869 between 8:30 a.m. and 5 p.m. ET Monday through Friday, email customerservice@kidspreferred.com or online at www.kidspreferred.com and click on “Contact Us” at the bottom of the homepage for more information. Hazard: The hat can detach from the policeman’s head and pose a choking hazard to young children. 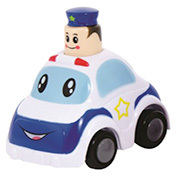 Incidents/Injuries: Schylling has received one report of the police hat detaching from the toy vehicles. No injuries have been reported. Description: This recall involves the Police Press & Go toy vehicles. The white plastic toy cars have a painted dark blue hood and trunk, light blue windshield with a black eyes and mouth painted on the front of the car. There is a police head coming out of the roof of the car wearing a blue police hat with a green star on the center of the hat. When the police head is pressed down it winds up the motor and the car moves forward. The toy vehicles measure about 2.5 inches wide by 3.5 inches long by 3.5 inches tall. “Schylling Rowley, MA” and UPC number “01964922782” are printed on the bottom of the toy cars. Sold at: Specialty toy and gift stores nationwide from April 2010 through April 2015 for about $5. Importer(s): Schylling Inc. of Rowley, Mass. Consumer Contact: Schylling at (800) 767-8697 from 8:30 a.m. to 5 p.m. ET Monday through Friday, email at SafetyAlert@Schylling.com or online at www.schylling.com and click on Safety Alerts & Recalls at the top of the page for more information. Hazard: The handlebars can loosen or separate during use. This can cause the rider to lose control and/or crash, posing the risk of injury. Description: This recall involves Marin 2014 model MBX 50 and Tiny Trail boys and girls bicycles with 16-inch knobby tires. The single speed bicycles have high-rise handlebars and training wheels. The boy’s bicycles were sold in red and have serial number HA14980XXXXXX. The girl’s bicycles were sold in purple and have serial number HA14982XXXXXX. Serial numbers are printed on a foil label affixed to the underside of the base of the down tube. “Marin” is printed on the seat and the downtube. “Tiny Trail” or “MBX 50” is printed on the bicycles chain guard. Sold at: Bicycles stores nationwide from September 2013 through December 2014 for about $250. Importer(s): Marin Mountain Bikes Inc., of Novato, Calif. Remedy: Consumers should immediately stop using the recalled bicycle and contact Marin for a replacement handlebar stem. Consumer Contact: Marin Mountain Bikes at (800) 222-7557 from 9 a.m. to 5 p.m. PT Monday through Friday, or visit the firm’s website at www.marinbikes.com and click on “Recalls/Safety” for more information. Hazard: The wheels of the airplane and the balls at the tip of the butterfly’s antenna can detach, posing a choking hazard to young children. Description: This recall involves plastic airplane and butterfly push toys. The airplane push toy is red and has a blue, yellow and red rotor above the cockpit’s canopy and eyelids on the nose of the airplane that open and shut when the toy is been pushed on the floor. The airplane push toy has a pink plastic rod with a handle that connects to the back of the toy to push it. The butterfly push toy’s body is yellow with pink wings and has a pink plastic ball at the end of each of two antennas and a pair of wings that flap up and down when the toy is been pushed on the floor. The butterfly push toy has a green plastic rod with a handle that connects to the back of the toy to push it. Sold at: LS Import stores in Houston, Texas from May 2014 through July 2014 for between $1 and $2. Remedy: Consumers should immediately take the recalled toys away from children and contact LS Import for a full refund. Consumer Contact: LS Import Inc. collect at (713) 780-3900 from 10 a.m. to 5 p.m. CT Monday through Friday for more information. Hazard: The die-cast metal cars can have sharp edges that pose a laceration hazard. Description: This recall involves a plastic toy truck with a plastic case that holds 6 die-cast metal toy cars in assorted colors. The truck is 14 inches long x 3 inches wide x 5 inches high. 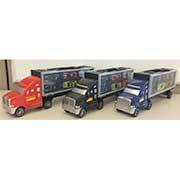 The cab of the truck comes in black, blue or red. The package is labeled as “Tough Treadz Auto Carrier” and has a white sticker in the upper right-hand corner with “$5” and “SKU 1004247” printed in red. The UPC code appears on a label on the back stating “Made in China.” The following UPC codes are included in this recall: 678565114083, 678565114090, 678565114106. Sold at: Family Dollar Stores nationwide from September 2014 through December 2014 for about $5. Importer(s): Family Dollar Services, Inc., of Matthews, N.C. Remedy: Consumers should immediately stop using the recalled toy sets, take them away and return them to any Family Dollar Stores location for a full refund. Consumer Contact: Family Dollar Stores at (800) 547-0359 from 8:30 a.m. to 5 p.m. Monday through Friday or online at www.familydollar.com, then click on Product Recalls in the Help section at the bottom of the page. More than 100 toy safety standards and regulations are in place to ensure the safety of children at play. We know parents have plenty of questions about what’s safe for their kids to play with and how to be on the lookout for any potential dangers. Ask the Toy Safety Mom, Joan Lawrence, your toy safety questions here, and read on for answers to FAQs Joan has received from caregivers like you. Hopefully these will help you better understand some of today’s safety issues and put your mind at ease. Are PE pellets, PVC and polyester fibers safe in stuffed toys? Toymakers have to meet several requirements designed specifically to ensure the safety of plush or stuffed toys. These requirements cover a number of issues, including material cleanliness and quality, seam strength, and small parts. To answer your specific concerns: yes, polyester fiber is safe to use in stuffed toys for all ages. Polyethylene and PVC pellets are also among the acceptable types of stuffing for use in toys, as long as the toy meets all applicable safety standards. Plastic pellets are considered small parts and may present an ingestion or inhalation hazard for children under three years of age if they become accessible — which is why a seam strength test is required. In fact, most manufacturers that use these pellets take the additional step of enclosing them in a second inner bag inside the toy. PVC needs to be free of certain phthalates, but the toy industry has been using non-phthalate alternatives for years. How do I know whether a toy is safe to put in the crib with my baby while she’s sleeping? I’m so glad you asked this, and the answer is an easy one—other than toys specifically intended to attach to the crib, like mobiles, music boxes, etc., it’s not safe to keep any toys, blankets, or other objects in the crib when your child is sleeping. If your baby rolls over and presses his/her face against these things, they could potentially block your child’s breathing. Let infants enjoy their playthings during waking hours and keep the crib clear of toys when they nod off to sleep. I’m aware that small parts can be a choking hazard for infants, but how do you distinguish between a dangerous ‘small part’ and a small object that’s safe? You’re absolutely right—small toy parts and other small objects found around the home can be a hazard to children under 3 and those who still tend to put objects in their mouths. More than 40 years ago, toymakers collaborated with pediatricians, child development experts, government officials, and others to develop small parts safety regulations for toys. Those regulations define "small parts" as those that fit entirely within a Small Parts Tester, which features a cylinder that emulates the size and shape of a child’s throat—2.25 inches long by 1.25 inches wide. Why are magnets dangerous for kids? Magnets can be a fun and educational feature in a toy. However, certain small, powerful magnets (known as "rare earth magnets") can pose a serious risk to children if they’re swallowed. There are strict federal standards in place to make sure that these magnets aren’t used in small toy parts that could be accessible to young kids. But other household products don’t have the same safety features as toys, and may contain small, powerful magnets. Lots of children (especially those under 3) have a tendency to put small objects—like magnets—into their mouths and noses. If they swallow or inhale a magnet, it can create a choking or breathing hazard. If they swallow or inhale multiple magnets, the magnetic attraction between them can lead to internal injuries—or worse. My advice: make sure to keep these small, powerful magnets out of your child’s reach, and teach them to never put magnets in or near their mouths and noses. If your child does swallow a magnet, seek medical attention immediately. My child is 2 years old but is interested in toys labeled for 3+. What should I consider before purchasing toys beyond his age? That's a common—and important—question. Selecting a toy that matches your child’s age is a critical first step to ensuring safe play. Sometimes I hear parents say that because their child is extremely smart or advanced, they (or proud aunts, uncles, and grandparents!) buy toys for them that are meant for older kids. It’s important to understand that age-grading’s primary purpose is to serve as safety guidance, based on various developmental skills and abilities at a given age, and should always be followed. Plus, picking a toy that matches your child's age helps them become more engaged in play. Sometimes, kids who are frustrated—because a toy is either too complex or too simple for them—come up with unintended uses for the toy, which can lead to unsafe play. Age guidance is a useful tool for finding playthings that are just right (and safe!) for your child. Joan is a lifelong child safety advocate with more than 20 years of experience in the toy industry. As The Toy Association’s senior vice president of standards and regulatory affairs, Joan manages the organization's product safety programs, including the development of safety standards and efforts to educate families about toy safety. 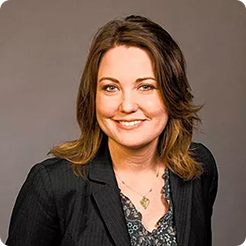 She works with government officials, medical experts, consumer groups, and toy companies to strengthen toy safety in the U.S. and around the world. Joan is the daughter of a prominent pediatrician, and a mom to three children. Play is our business—and keeping kids safe while they play is the #1 priority for The Toy Association and its members. The Association has a long history of leadership in toy safety: the group helped develop the first comprehensive toy safety standard more than 40 years ago, and continues to work with government officials, consumer groups, and industry leaders on ongoing programs to ensure safe play. © 2018 The Toy Association. All rights reserved. © 2018 The Toy Association.